Ocean City - "Complex at the Center of the Universe" by Marek Staszek is the winner of the digital art competition NVArt Challenge with main theme "Art Space: Architecture and Landscape". Marek Staszek: "The most beautiful places that come to mind always have water, steep cliffs and tropics in common. Lush turquoise colors emphasizing positive vibes, something I've never seen. I wanted to achieve complete integration of future architecture with nature, complete with green parks, trees and gardens. Everything that makes us feel relaxed and calm. Architecture can give people magnificent vistas, as well as a small historical old-town feel. 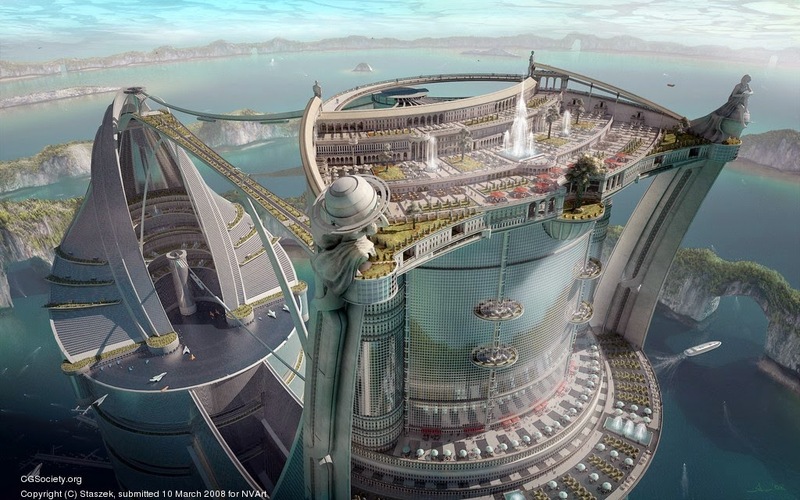 This might be a futuristic city growing somewhere in another galaxy on a planet similar to our own."